Hall Road Rangers were crowned Billy Fletcher Myton League Champions 2008/9 finishing 7 points clear of nearest rivals Hessle Sporting – the season finished in an anti-climax when Hessle Sporting chose not to play the final game of the season but the lads still turned up at Dene Park to celebrate their hard fought success. Rangers completed the season with a near perfect record, recording 18 wins, 1 draw and just 1 defeat and with a massive goal difference of 104 nearly 50 goals better than their nearest rivals, having scored 131 goals and conceded just 27 – a superb performance from the whole team. Harry Butler top scored with 27 goals and Ryan Beckett scored 23 despite both players missing games through broken wrist and arm respectively, but five other players reached double figures to ensure they were rarely outscored. 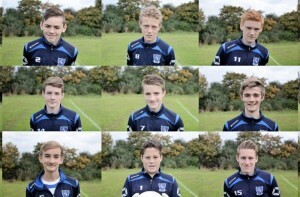 The league win is all the more impressive as the team had an influx of new players with 5 additions to the squad joining at the beginning of the season; Harry Butler, George Watts, Lewis Shaw, Conor Noble and Harvey Farrow all played major roles in the seasons success alongside the core of the team from the previous season. The success of the team brought further honours; Winners of the HBSFL 5 a-side competition whilst several players have been selected by Hull City, Karl Bellis having accepted a contract early in the season, whilst others have been selected for trials through the season. The HBSFL Representative Team selected George Stafford and George Watts after trials and both have played major roles in a successful season with wins over Football League Academy teams, whilst many of the team have represented Hull Schools in a hugely successful season having reached finals and semi-finals in national and regional competitions. The success of Hall Road Rangers has been a great effort from all concerned particularly the players, supporters and staff at Dene Park but most importantly the coaches and Manager, Steve Chew who are all very proud to be the first winners of the Billy Fletcher Myton League. Harvey Farrow, Jay Farrow, Matty Aistrop, Liam Mulligan, George Stafford, Tom Dixon, George Watts, Harry Butler, Danny Symes, Kenny Hardy, Ryan Beckett, Lewis Shaw, Conor Noble, Phil Whincup, Harry Wilkinson, Chris Mee, Max Slide.